These photos were taken yesterday just minutes apart of each other. 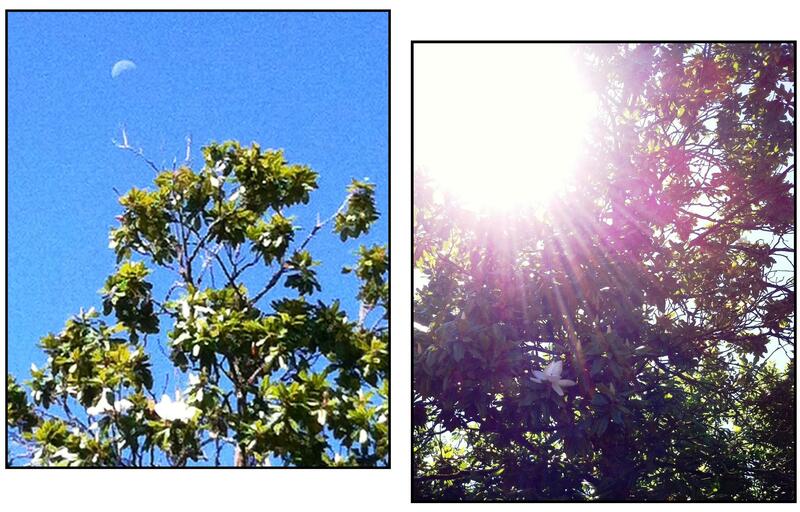 Both show the same giant magnolia. All I did was move to the other side of the tree. Two very different effects. Two very different moods. One depicts the cool presence of the moon fading in the morning sky. The other shows the brilliance of the sun bursting through with all its fiery power. Like the giant blossoms, we rely on both the sun star and the moon for balance and beauty. The next time you are trying to get clear about a challenge with your home – anything from how to arrange furniture to how to create more space in your place – try shifting your position just a bit. Move to the other side of the room, sit in the middle of the floor, stand on a step stool – you might be surprised at the options that appear from a fresh perspective. See you on the clear side! Note: For inspired ideas on Sun and Moon Energy, visit my Pinterest boards. Next Article Need A Little Rain?